Canadians have donned jerseys to honour 16 people who died when a bus carrying a junior ice hockey team collided with a lorry at the weekend. Country pop singer Shania Twain, Toronto's mayor and thousands of others shared photos online with the hashtag #JerseysforHumboldt. It was the latest nationwide tribute to the Humboldt Broncos team. Dayna Brons, a 24-year-old athletic therapist who was on the bus, lost her fight for life on Wednesday. Her family said in a statement: "She was surrounded by those she loved and those who loved her. "Dayna will be forever remembered for her joyful smile, and her passion and love of sport." Many others were injured in the 6 April crash on a rural road, involving members of a hockey team between the ages of 16-21. The tragedy has shocked Canada, where ice hockey is not just a national sport but a huge part of its identity, especially in rural communities where many children begin to play as soon as they can walk. Canadians have responded in a number of other ways - from leaving their hockey sticks on their doorsteps to a surge in new organ donors. A group of hockey parents suggested the "Jersey Day" online and the campaign quickly spread, with more than 7,000 saying they would join in. "We will wear our Jerseys to show our support and send our love," reads a Facebook event online. Pictures have been pouring in all day on social media, even from as far away as Belfast, Northern Ireland and Uganda in Africa. 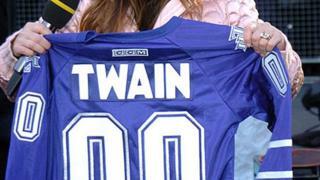 Canadian country singer Shania Twain also voiced their support, and posted their jerseys on social media. Corporations like coffee chain Tim Hortons and supermarket Sobeys also encouraged employees to wear jerseys instead of their uniform.